Branding, Web Design & Drone Videography. 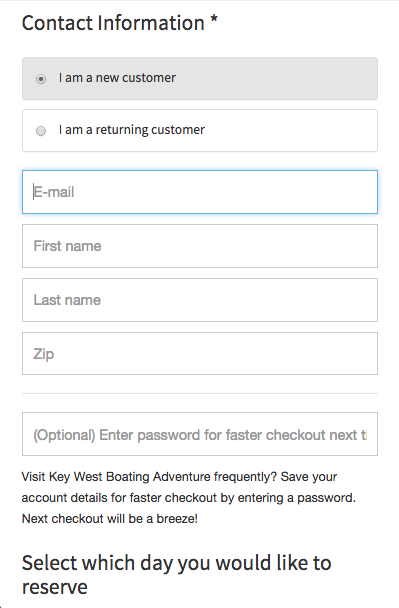 Key West Boating Adventure needed a booking site that was as fun as their business model. Captain Eddie and his wife Melanie offer private boat charters, exploring all that Key West has to offer. Key West Boating Adventure offers snorkeling, dolphin tours, spearfishing, island hopping and sunset cruises. In order to capture the magic of the Key West experience, we flew down to meet with Eddie and Melanie, and spent time experiencing their boat charters first hand. In order to create a captivating user experience and attract potential adventure-seekers, we wanted to create a video-based website featuring drone videography taken during our time with Key West out on the water with Eddie and Melanie. With extensive experience integrating video into dynamic websites, our work with Key West Boating Adventures gave us a unique opportunity to take our content-first design style to a whole new level. From concept to completion we created a cohesive video story for Key West Boating Adventures showcasing each of their unique tours with striking background videos that work seamlessly with the website’s playful nautical theme. Creating a logo for Key West Boating Adventure offered a fun challenge. We wanted a playful design that captured the essence of the Key West experience. The paper boat logo our team came up with is a perfect balance of modern and whimsical without feeling too on-the-mark. In order to create a unified brand for Key West Boating Adventures across social media platforms, we designed a custom Profile Picture and Cover Photo for their new Facebook Page as well as grew a local following. To mirror the look and feel of our web design, we used photography taken in Key West by our onsite team in tandem with our drone videography. The Cover Photo features both the vibrant waters of Key West and Key West Boating Adventures’ local muse - Melanie. In order to create a useful booking platform for all of Key West Boating Adventures’ excursions, we needed to understand more about how they book their charter boat experiences. After we learned more about their process, we created a Booking Form with specific fields to enter information like their name, contact information, the number of passengers, excursion date, time, specific excursion activities, and if they wanted to pay in person or online. This Booking Form then pushes the user's information to Eddie so that he can track his leads and reach out to his clients to offer important updates and information before their booking date. Key West Boating Adventures meets most of its clients in person at their dock in Key West. We wanted to bring the personal experience of meeting Eddie and Melanie to their new booking website. Our goal was to draw users in and encourage them to experience a bit of the Key West first hand, then make it easy for them to access tour information and book their charter all in one easy to use platform. We knew Eddie and Melanie’s unique story was worth sharing with the world -- who could resist a lifestyle centered on adventure? -- but capturing the experience Key West Boating Adventures offers was an adventure of its own. We are grateful to have worked with Eddie and Melanie, and we hope to keep their business one step ahead of the rest by continuing to improve and update their dynamic video-based website as their business grows.